Here is a remarkable ancient miracle-working Byzantine image of the Virgin Mary from Philotheou Monastery’s Katholikon, or main church, on Mount Athos, the thousand-year old monastic republic on a peninsula in northeastern Greece. The icon sits in an ornate kiot, or free-standing icon stand, in front of the iconostasis or altar icon screen in the church and has a beautiful and quite elaborate metal riza which covers the icon most of the time. Rizas were made to protect icons before the widespread use of glass as a protection, and they were made with love by the Faithful to adorn icons after the icon had been produced. This image is shown here with the riza off, so we can see much better and more clearly the fine details of the icon itself. 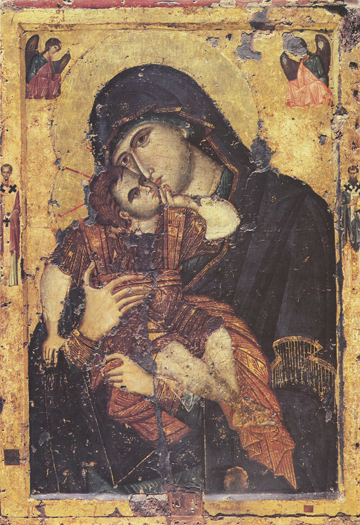 Sweet-Kissing icons show the Lord and His mother touching their cheeks in a tender embrace. As it says in the Vespers Service on Christmas Eve, “The undefiled Virgin, beholding the pre-eternal God as a child that had taken flesh from her, held Him in her arms and without ceasing she kissed Him.” Two angels look down in adoration at the Mother of God holding the Lord sweetly.